It’s true: sometimes, these guys escape history. Have you ever found yourself in a sticky situation, which dictated that you say something tactfully uplifting, yet the plain-as-the-nose-on-your-face truth was that there was just no good way to put credible lipstick on that pig? This blog post and the next five are a sad saga of my trying to do just that and the unintended consequences that followed. What thanks did I get for gamely trying to put the best face on an awkward situation? NONE. What I received instead was years’ worth of harassment for my good deed – harassment that slowly spread through my husband’s family, eventually engulfing the lot of us. Husband’s Little Sister and her family suffered a house fire December 6, 1984, that burned their home to its foundation and everything in it – in one short hour. A wicked combination of a furnace problem combined with a wicked Nor’wester wind, it was devastating, as you can imagine. They were well-insured, so the long-term prognosis was as good as it could be in situations like that. In the short term, though, they needed everything – pronto. On Christmas break, we visited them to do what we could to encourage them. By our arrival, they’d been thoroughly encouraged by their friends and the entire community in one of those quintessentially American, feel-good stories. They’d been quickly settled into an empty rent house, and their little community had poured out its wallets and donated home furnishings, household supplies, clothes, even Christmas-gift replacements. Now, pay attention, because right about here is where it gets messy. It’s something you already know: some people’s idea of what is beneficial to people in this situation can be slightly out of kilter. One might be tempted to say they were looking for a way to offload their junk, but we won’t go so far as to say with certainty that’s what happened to Little Sister and her family. We’ll let you be the judge. 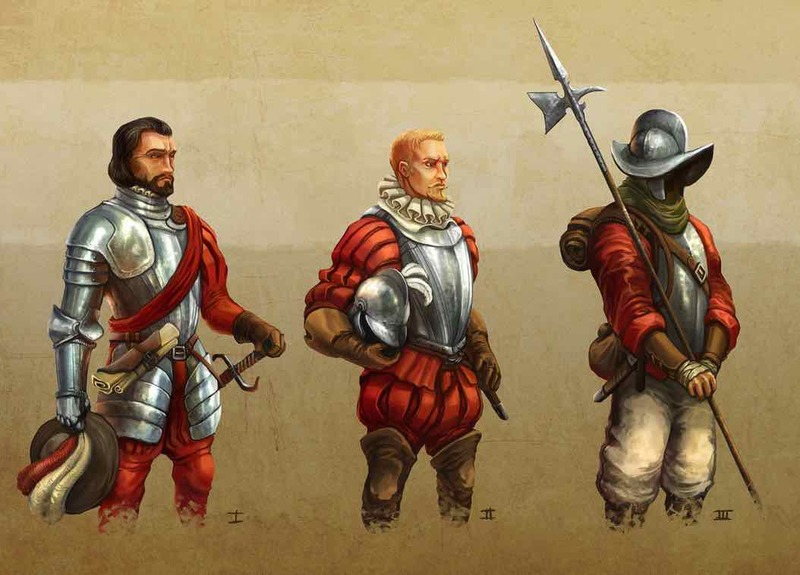 A good four feet tall, they were banged-up gaudy-gold, Spanish conquistadors who had escaped their era, much like Time Bandits, and come to live right on the edge of The Deep South, of all places. Complete with crested shields and swords, they were even wearing the pointy helmets those fellas liked to wear. It was hard to imagine sane people saying to each other forty or fifty years prior, “Oh dearest, won’t these just make our new Colonial Spanish decorating scheme?” – and sincerely meaning it. Ooo. Land mine ahead. Remember, they’d just lost everything and had been overwhelmed by the community’s generosity. Losing everything is very, very serious business. Being flooded with good will is humbling. Lots of emotions flying around that little rent house. 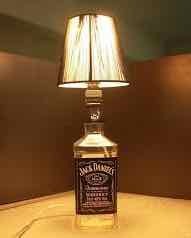 He did seem truly grateful, and it didn’t seem the moment for raucous humor about how U-G-L-Y Ugly those lamps truly were. So I took the high road. Skirting the entire Ugly Issue, I allowed they were a trifle large, and perhaps he could salvage the sockets, harps, and electrical cords. Having rewired a few lamps myself, I secretly gave myself an A- for a vague, yet helpful, answer to such a loaded question at such an emotionally charged time. In an uncharacteristic fit of tactfulness, I was desperately trying to be NICE. The next morning, we packed our van and took off on the next leg of our journey, a six-hour drive to my in-laws. Barely half a mile down the road, we stopped so I could rearrange items making annoying squeaks. As I climbed past my captain’s chair to the open area in the middle of our converted van, there sat The Conquistadors right behind my seat, all settled in and excitedly looking forward to their new home. So much for the high road. What’s the pay-attention tip in this saga, at this point? as nearly as I can figure. (I stole that, BTW; see below.) I really was trying SO hard to be upbeat and positive and tactful, and look what it got me: a PAIR of U-G-L-Y Ugly! 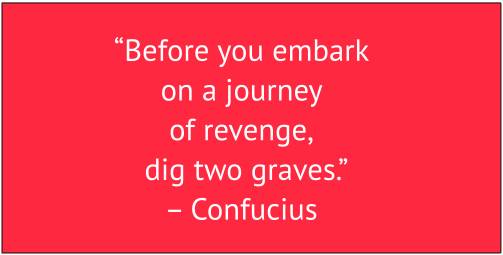 I decided I was done with nice and would henceforth become all about revenge. In Part 2, you’ll see how well that turned out. 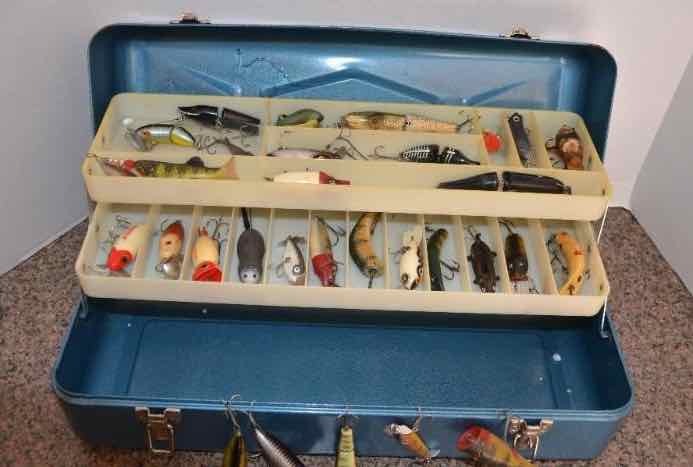 Boasting and tackle boxes just go together. Remember that high school episode when a girl (who wasn’t the least bit cute) stole your boyfriend (the one you kinda took for granted, seeing as how you were cute and SUCH a catch) – and you didn’t even see it coming? What a shocking, tear-filled, angst-ridden experience that was! Remember when you pulled an all-nighter for that college exam solely for the anticipated pleasure of setting the curve and a teensy bit of boasting afterward? Remember your roommate, that sorry excuse for a student (who never cracked a book) who beat you by ten crummy points on said exam? Thought so. I’ll stop right there with my trip down Memory Lane. Like me, you probably have a host of memories like these that you cannot seem to expunge. Fortunately, most of us don’t dwell on them. We hardly ever think of them till some spoil-sport like me brings them up. Fortunately, they’re pretty confined: they’re very personal experiences. Very few, if any, people in your current life know your old and painful stories. Thank goodness, because that means you won’t hear them endlessly retold. Family stories, on the other hand, are property held in joint tenancy. Folks sharing the same twisty DNA strands all have “rights” to them. And most families do have stories they like to tell on each other over and over and over. Eventually (in most families), even the chump of the story is able to laugh after enough time passes. Read on for a superb example of family lore – with an easy-to-remember, pay-attention point, of course. Spoiler Alert: it has a most gratifying conclusion. Once upon a time, there was a Big Brother who had been invited on a weekend fishing trip just far enough from home to make it an adventure. He was to fish on a trout river reputed to supply boatloads of trout to savvy anglers. Topping the imagined fish haul was the company he’d keep. He and his father would join his father’s friend and that friend’s son (also a friend of Big Brother). Four guys doin’ what guys do. Yessiree, it was shaping up to be a testosterone-infused weekend, with a cooler full of fish at its propitious end. Big Brother had two sisters. The older of the two played it cool. Even though she, too, dearly loved fishing, she would not give proud Big Brother the satisfaction of knowing she would’ve loved to go, too, if she’d been invited and if it wasn’t so much a guy-bonding trip. By the way, this was an exhibit of wisdom-beyond-years: never enter the fray unless you have a decent shot at winning. She knew she had no chance of being invited on this fishing trip, so she did the wise thing: she kept her powder dry. The younger of Big Brother’s sisters being all of six years younger, didn’t possess the maturity to be coy or wise. She could barely hide her ire that jerky Big Brother had been invited to go somewhere and she had not. She didn’t care that much about fishing; it was the irritating unfairness of it all that set her off. Big Brother got to go everywhere, and she NEVER got to go anywhere! As big brothers are prone to do, this one boasted and crowed and then boasted some more. He boasted about the special restaurant meals they’d eat. (Restaurants were seldom in this family’s budget.) He boasted about how late they’d stay up. He boasted about how many trout they’d catch. He boasted about how yummy those trout would taste after being roasted over a campfire. Little Sister silently fumed. She maintained her cool but only just. And then, a day or two before lift off, she suddenly flipped off the Cool Resentment Switch and flipped on the Syrupy Sugar Switch. Mamma was mildly puzzled. Dad didn’t even notice. Big Brother was oblivious, being too full of himself to question the 180-degree reversal. Middle Child, though, quietly observed this new development but kept her theories to herself. As the intrepid fishermen backed out of the carport, Little Sister stood beside Mamma and Middle Child to wave good-bye. Waving cheerily as they passed, she skipped back into the house to her dolls. As the day went on, Mamma gave this scenario further thought and began to smell a rat. Pretty sure something had occurred that she might ought to be concerned about, she asked Little Sister, “And why are you so cheerful, Little Missy?” Little Sister innocently answered, “I’d sure like to be in that boat right about now” and continued playing contentedly. Family lore has it that she had that sweet glow of contentment that comes only with the flawless delivery of well-deserved revenge. Meanwhile, in the boat, it was time to get serious about the manly job of fishing. Dad and his friend put their heads together to decide what the trout would bite on, given the time of year, type of trout, yadda, yadda, yadda. Big Brother and his friend imitated their fathers and opened their tackle boxes to find the same lures. At this point is when Little Sister’s precocious insight into what winds up testosterone-filled boys had its intended effect. As cocky Big Brother confidently flipped open his tackle box to pull out the correct lure, he found something that didn’t look very lure-ish. At that precise moment, the air explosively escaped from his testosterone balloon. Little Sister, playing contentedly with her dolls 200 miles away, had just poked a big ole fat pin in that sucker. Quickly whapping the tackle box shut and already sweating profusely, he nervously reviewed his options. He could pretend to be sick and ask to be taken back to the motel. Nah. Dad, not known for empathy, was fixated on a full day of fishing and would just tell him to barf over the side of the boat and get over it. He could “accidentally” dump the whole tackle box into the lake and ask to borrow lures from the others. Nah. Then he’d be minus fishing tackle from now on – not just for a weekend. Even in his panicked state, he realized that was a long-term solution to a short-term problem. It’d taken years and a lot of part-time-work moolah to accumulate his stash; it’d be dumb to throw it all in the drink. He could inch the lid open, pull out the testosterone deflater, and surreptitiously throw it over the side of the boat. Nah. The dang thing would float, Dad would recognize it, and blab to the others. Big Brother, knowing exactly who had placed the testosterone deflater in his tackle box, decided there was no rational escape from facing the consequences of his insufferable behavior toward Little Sister. He resolutely opened the tackle box, calmly removed Teddy (his trusty bear friend from his toddler years), gave Teddy the little bit of dignity he could by sitting him upright in the bottom of the boat, and acted as if this were perfectly normal behavior for a teenage boy on a guy fishing trip. By all accounts, this was Little Sister’s stupendous coup de grâce. It gets even better when you start speculating on Big Brother’s explanation, as he feigned shock and surprise. “I don’t know how this got into my tackle box!” and “Of course, I don’t still sleep with a teddy bear!” (As he was an uneducated Philistine when it came to knowing Shakespeare, he probably hadn’t heard about “Methinks thou doth protest too much.”) We can only assume (since he’s not telling) that as he kept up his protestations of innocence, the other three guys in the boat became more and more certain they’d invited a colossal SISSY on their testosterone trip. You gotta love this kind of story. And as I’ve said before, I don’t make this stuff up (at least not the basic story outline). * I merely report it. You’re laughing now, but I’m sure you’ve had similarly humbling experiences that you very much deserved. And you remember it’s never funny when you’re in the middle of it. In fact, just like Big Brother, not only did you fail to see the humor, you were probably just as devastated, mortified, and ready for revenge. The good news is that Big Brother, like most of us, learned to see the humor, tell the story on himself, and even laugh at himself. What’s the pay-attention point? I should think it would be painfully obvious. Boasting is a bad habit. Family lore ends abruptly at this point of the story. Evidently, there were no serious repercussions for Little Sister. Everyone else in the family probably wished they’d thought of Tackle Box Teddy, and it’s highly unlikely Big Brother received “you poor thing” murmurings of sympathy from any of them. Lacking familial sympathy, Big Brother was forced to learn a humiliating, pay-attention lesson. Even in his teenage, brain-dead condition, he’d worked out the simple truth of the matter by the end of the more-exciting-than-he’d-planned fishing trip. He’d received what he deserved for his incessant boasting, should forgo revenge, and leave well enough alone. I, however, never leave well enough alone. (Borrrrring.) Once a year, I give Tackle Box Teddy a well-deserved place of honor under our Christmas tree. 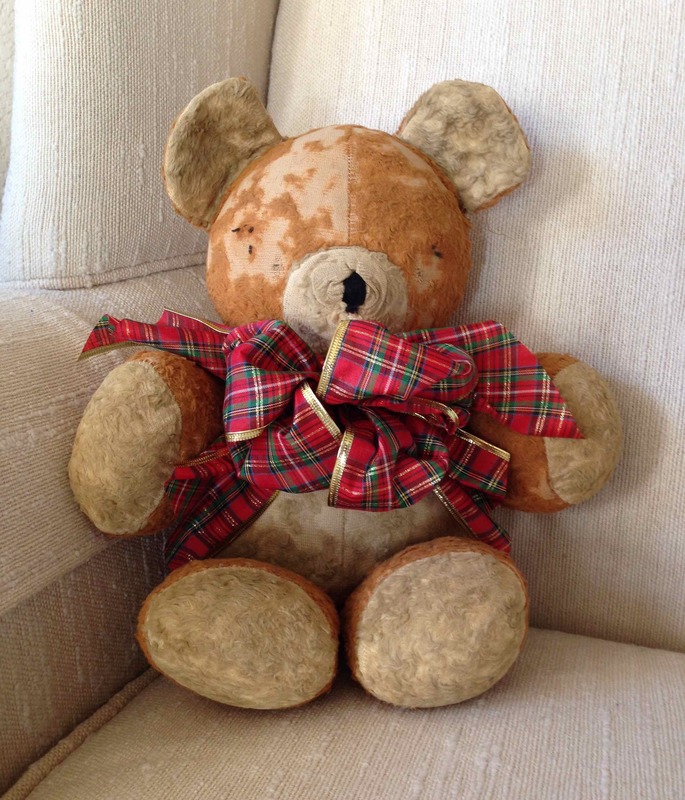 Yes, I’m Big Brother’s wife, and I drag out moth-eaten Teddy and dress him in a fluffy, estrogen-laced tartan bow. (I have to put something around the poor thing’s neck to hide the hole created by a botched tracheotomy from yesteryear.) Yes, Tackle Box Teddy is an excellent reminder for Big Brother that boasting NEVER, EVER pays off. Isn’t Tackle-Box Teddy sooooooo cute? It keeps him humble. Well, not really. Learning that boasting never, ever pays off turns out to be a slippery pay-attention lesson that slides away from Big Brother from time to time. Occasionally, Tackle Box Teddy has to make a between-Christmases visit to administer some much-needed comeuppance. And it works – for awhile. (One of my many comeuppances came early in our marriage. Here’s why boasting is such a very bad habit. *A semi-admission of guilt: Seeing as how I wasn’t actually present at this party, some of the “facts” may be slightly embellished – or not. Who’s to say? Homemade green chili. Yummy? Depends…. Do you know anyone whose chirpy cheerfulness just make ya sick? Do you know anyone who constantly pulls harmless pranks in a persistent effort to cheer up any and all in his presence? I do. I’m married to him. And I’m willing to say publicly that one can take only so much unrelenting good humor. After a point it becomes, well, annoying. You might wonder why I’m going public with such a dangerous admission. Simple: I have lots of backup. Friends who know my little honeybunch also reach a point after which they’re just DONE with his boundless geniality and endless pranks. And I can prove it. A couple of years ago, Hubby joined a yoga class, a part of our church’s wellness program. He knows most of the class members and happily spends an hour grunting and moaning as he and his middle- and senior-aged friends Down-Dog themselves into alarmingly precarious positions. He tosses out jokes, harmless barbs, and (what he thinks passes for) witticisms from the time he pulls the prerequisite yoga strap and cork block from the supply closet until he’s lacing his trainers after class. I know, because I took the class with him for a few months. A few months were all I could stand. (Okay, maybe arthritis also had a little to do with my exit.) Remember, now that we’re both retired, I LIVE with this persistent cheeriness 24/7. Class members, escaping the 24/7 sentence, generally put up with his merry antics in the interests of maintaining a certain yoga-ish esprit de corps. Most of the time. Other times, not so much. 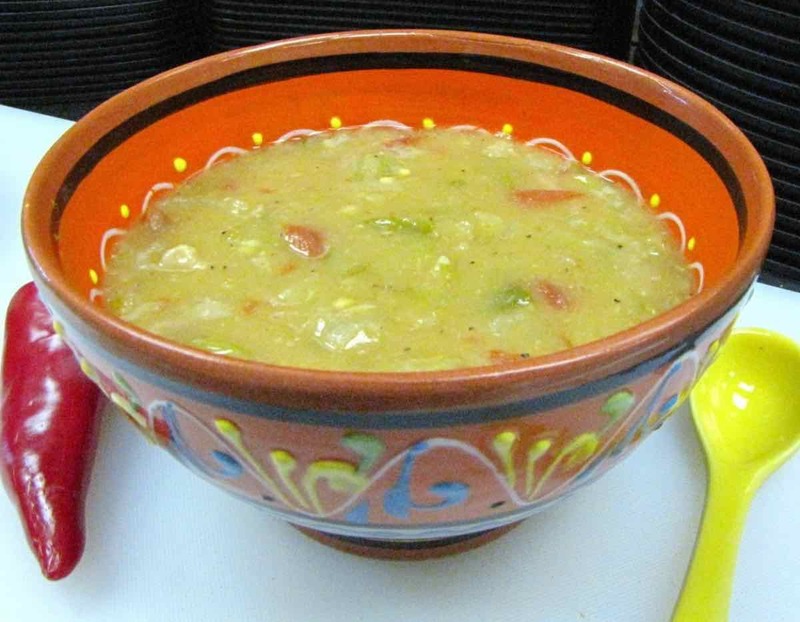 One of our friends in the class makes a mean green chili. This stuff is GOOD – if you can stand the heat. Hubby is always tickled when she brings a recycled plastic container of her dragon-fire green chili. He squirrels away each too-hot-to-handle bowlful in our freezer, reserving it for a time when he‘s hankering for a fiery bracer. Not long ago, he found one of these precious gems while rooting in the back of the freezer. “Whoo-hoo!” You’d have thought he’d found gold. He couldn’t be bothered with waiting for it to thaw. Instead, he upended the whole container over a saucepan and gave it a good whack. The whole frozen block plopped out with a promising thud. Unfortunately, that promising thud wasn’t promising what he thought it was promising. Staring back at him from the saucepan was a block containing a thin layer of the fire-breathing green chili that he’d been drooling for, topped by a chunky, unappealing wad of frozen black socks. Yes, socks. I could be wrong, but I’ll bet Hubby won’t be sharing his grubby socks with anyone in yoga class from now on. As I said, though, I could be wrong: sometimes, he gets very near thick-as-brick status. But don’t you be thick-as-brick. You, too, have this problem. Yes, the awkward truth is that all of us have at least one area of our lives in which we consistently don’t practice moderation. No news there. Here’s the tricky bit: when ours involves a positive personality trait (like Hubby’s), we tend to give ourselves a get-out-of-jail-free card. Our fellow travelers in life, however, don’t. Don’t think you have an area of your life like Hubby’s? Ask your spouse or best friend. They’ll happily – and with alarming speed – tell you what you routinely do without moderation. Once you’ve opened the flood gate, they may even recite recent examples of your over-the-top behavior, proving beyond a doubt that you have a habit of taking a good thing too far. Like Hubby’s sock prank, your positive-behavior actions, practiced without moderation, will eventually boomerang. Will you welcome them when they return? Hubby didn’t. Having an expert’s fire-chili cruelly ruined by his very own stinky socks had its intended effect. I’m fairly sure because I think I’ve recently detected a downtick trend – very slight, but trackable – in his persistent prankishness. *Our friend’s no-harm-no-foul revenge for Hubby’s dogged ebullience is sure to become the gift that keeps on giving. I can picture her chuckling every time she dons black socks. You go, girlfriend! Too much of a good thing is still TOO MUCH. Strictly Hollywood, right? Wrong. SO wrong. If you haven’t read Part 1 and Part 2 of this Odd #17 blog trilogy, best go back and do so, else a good portion of the humor in this Part 3 will be lost on you. You know how – more often than not – what goes around comes around? Some time after the Kenneth-Genevieve unpleasantness my new husband endured, it was my turn to be blind-sided by blatant, gene-pool oddities. Yes, I neglected to ask the important question I advocated in Part 2. See? I wasn’t kidding when I said simply reading this blog means you’re getting the benefit of painfully learned lessons, minus the pain. My excuse? I was young and too naive to know I needed to ask that main pay-attention-point question in Part 2. In the early months of our marriage, we traveled several hours to my in-laws’ home in Oklahoma. Not long after we arrived, a visitor quietly arrived. Someone answered the door. Hushed greetings were exchanged. The visitor walked up the stairs of my in-laws’ split-level house and turned the corner to enter the living room door. I, the unsuspecting newest member of the family, was sitting on the hearth, soaking up the fire, when he made his entrance. Unlike Hubby’s plunge into my gene pool, I received NO warning – not even the three-minute warning he received – of who had just entered my new in-laws’ home. Taking up the entire doorway with his wide stance, stood a tall cowboy-ish drink of somethin’ who looked vaguely familiar, though I was certain I couldn’t possibly know him. (Did I mention my new husband was the buttoned-down-collar, penny-loafer sort?) As I checked off his cowboy-wardrobe, my mouth increasingly dropped open until I’d worked my way to an undignified, trout-mouth expression. Ten-gallon Stetson hat (removed, so he could fit through the door). White, of course. CHECK. Cigarette (a Marlboro, perhaps?) dangling from his mouth. CHECK. Rolled red bandana handkerchief peeking out from his shirt collar. CHECK. Bolo tie (with what looked to be real–silver tips) around the shirt collar. CHECK. Plaid western shirt, complete with definitely fake pearl snaps. CHECK. Hubcap-sized belt buckle, emblazoned with Texas star. CHECK. Tooled leather belt with all the appropriate insignia. CHECK. Levi jeans, worn and faded. Blue, of course. CHECK. Pointy-toed, bull-hide, cowboy boots with the prerequisite decorative stitching. CHECK. 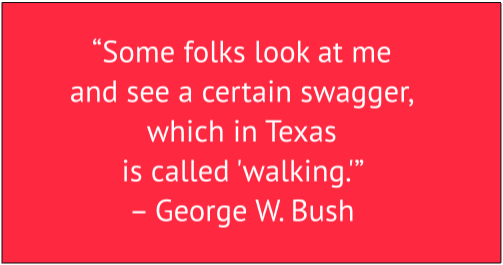 I’m not talkin’ texan Texan, y’all. I’m talking TEXAN Texan! 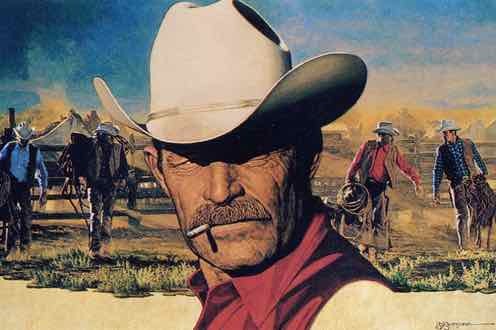 The Marlboro Cowboy, incarnate! Now, I knew how Texans looked. I’d seen plenty. I had, after all, watched the cowboy-and-Indian shows and movies that all American kids watched in the ’50s and ’60s. But this was the first time I’d seen one out of its natural habitat. Wow! Apparently, they look larger-than-life when they show up outside of Texas or even outside a Hollywood Texas set. While I was preoccupied with the cowboy wardrobe checklist, my in-laws were occupied in greeting The Marlboro Cowboy. After checking out his wardrobe authenticity and while they were still meeting and greeting, I slunk over to the window. The Marlboro Cowboy drives an old, mud-encrusted pickup? WHAT??? He’s supposed to ride a horse. Where’s his HORSE?? Puzzled and disappointed, I sneaked back to join the in-laws and soon realized I couldn’t understand a word The Marlboro Cowboy was saying. I was pretty sure we hadn’t crossed any national boundaries on our way to my new in-laws. However, we had crossed the Mason-Dixon Line. Though it isn’t technically a national boundary, you can never be certain what might happen once you cross that line. Things are different down there. I always pray diligently each time I cross it that I’ll be able to sprint back across should they decide to close it. Don’t laugh; stranger things have happened. As I said, they do things differently down there. WHAT is The Marlboro Cowboy saying? I wondered. Better yet, Why is he HERE?? And I continued to chew on those questions during his entire visit, sitting in solitude, since the conversation swirling around me was largely unintelligible. After he left, I learned he’s Great Uncle Jesse, of course – one of my husband’s grandmother’s four brothers. “You could’ve warned me,” I hissed to Hubby, when I could do so discreetly. See? This pay-backs story just proves what I’ve been saying in this Odd #17 trilogy. We each become comfortably accustomed to the more eccentric bits of our gene pool. In fact, they seem fairly normal to us, and we seldom stop to consider their effects on the uninitiated. Hubby hadn’t meant to hide his genes, either. He simply never thought to mention, like my clan didn’t, some of the more eccentric members of his extended family. He also didn’t give a thought to the fact that his wife had grown up north of the Mason-Dixon Line, and that she would be very, very, very caught off guard by such a character. Furthermore, it never occurred to him that she wouldn’t know the secret handshake or the dialect. I know. I know. This harmless swish into my husband’s gene pool can’t compare to his abrupt Kenneth-Genevieve shove into the shallow end of my gene pool. I can’t whine, really, especially since The Marlboro Cowboy’s visit was mercifully short, compared to the endless Kenneth-Genevieve bit of theater that Hubby endured. (Texan cowboys, it turns out, don’t have a lot to say.) I tell this story only to reinforce what I stated in Part 2 of Odd #17. Having done that, do remember they all share the same gene pool. 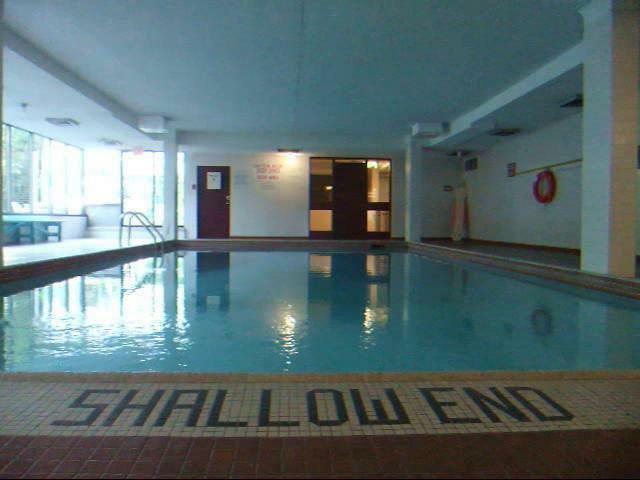 Now, ask yourself, Do you want to jump into that pool or not, Little Missy? FYI: “till death do us part” can turn out to be an interminably long time. Think about it. I certainly have, but after the I-do part. More’s the pity. Damage-control time: some facts have been changed –no, not to protect the innocent – to embellish the story, silly. For instance, it might have been Skoal snuff, rather than a Marlboro ciggy. Okay, maybe I tweaked a few other minor details, too. But I promise, the embellishments are just that: mere lipstick on an otherwise true-to-life story that’s meant to serve as a clear warning to all young lovers considering matrimony. Ask. Ask. Ask! Yep. There’s just somethin’ about those Texans. I promise it will all be made clear. Trust me. You know how some kids get labeled early on? They’re either so obviously brilliant, they’re hailed as the next discoverer of something, maybe even something as amazing as penicillin. Or it’s the opposite; family members resign themselves to the unpleasant fact that this one might be an embarrassment to the whole clan, not to mention a drag on all of society. But, of course, sometimes kids get labeled incorrectly. Einstein comes to mind. In fact, you’ve probably heard of or personally know someone who didn’t walk or talk on schedule who still turned out to be successful. Everything was pretty much okay their first few years and when it wasn’t, they decided to speak out about it: THEN they started talking. Or they were born uber-efficient; If others will bring me things, why should I crawl or walk to get them? They didn’t start walking till they wanted something no one would bring them. This is a true story, just so you know. And for once, I’m not the one learning the lesson the hard way. It’s about a dear friend, who shall remain nameless (his initials are B.O.B. ), who did indeed learn a very jolting lesson in the hardest of ways. 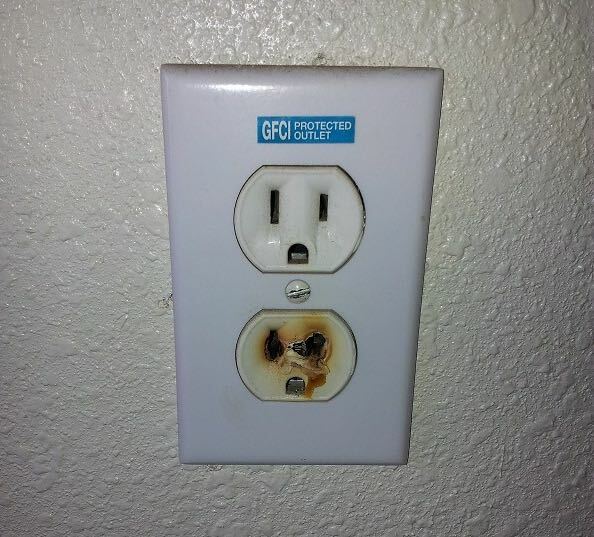 The next day, after having had 24 hours to recover from his mysterious propulsion across his grandparents’ living room, my friend studied the blackened outlet he’d created. Paying attention to the rest of the room, he discovered there were four more! Would they all produce the same effect, or was it just THAT one, I wonder? Only one way to find out. And he wasn’t. He was SO not-right. He was so far above not-right that he is now an eminent immunotoxicologist – one of handful in our nation. Yep. Definitely not your average kiddo. The makings of a beady-eyed, experimenting scientist were already in place at the ripe age of seven. You’ve been paying attention; it sounds a bit like I’m bragging, doesn’t it? I am. Having no impressive credits of my own, I like to brag about my impressive friends, and I absolutely love throwing out long words like immunotoxicologist just to watch people’s faces. I especially like knowing his humble beginnings. Of course: it’s hard to predict where sticking a knife into an electrical socket or any number of other, not-right behaviors will propel a child. Could be just an embarrassing toss across a room and a lifetime of similarly self-defeating behaviors – OR a preview of the child’s propulsion into an exciting profession that benefits thousands. Should be, “Danger! Danger! Danger! Danger! Odd #17, Part 1, do it. You know how it is. Families get used to the not-quite-right characters in their midst. They doggedly resign themselves to hunkering down and soldiering on through each embarrassing episode. People who marry into said families, though, are seldom forewarned and, thus, totally unprepared for such unflappable hunkering. It was our first spring break as newlyweds. My new husband and I had driven 500 miles so that he could get to know my family a little better. Oh my. Neither of us had any idea just how much better he would know us all by the end of that fateful spring break. In fact, even now, after 46-plus years of marriage, he can still get a little peevish when retelling it. Now just try to imagine yourself plunked down into the middle of this drama with absolutely no warning. You hear a car a little distance away on the limestone gravel road, which sounds like it’s slowing down. You watch your new father-in-law propel himself out of his recliner, roaring, “Uncle Kenneth!!! !” You watch, slack-jawed, as this normally soft-spoken and dignified man dashes out the front door, shoving on his slippers, stumbling as he goes. Your new mother-in-law sprints to the kitchen, sticks her head deep into the freezer, and begins feverishly pawing through frozen packages of who-knows-what. Your sweet, 11-year-old sister-in-law jerks the toss pillows out from behind your back and plumps them furiously. “Up!” she commands, suddenly becoming very bossy and very intent. The steely look in her eyes convinces you to do as you’re told, even if it is just a little 11-year-old barking the orders; you get up off that couch. As she moves on to straightening the magazines and newspapers and you stand there in the middle of this flurry, you realize your new wife has raced to the bathroom. Is she ill? You follow. Nope; she’s furiously cleaning, as if The Queen herself is about to make an appearance. Well, well, you might be prone to think. You lucky bloke! You’ve married into money and didn’t even know it. By now, you’ve decided to join your frenzied in-laws, and you race out to stand beside your new father-in-law and greet the filthy-rich relatives that everyone in the family is working so hard to impress. Hmm. They don’t look rich. Ah, well, most of her relatives who are well off don’t want anyone to know, so maybe these people are cut from the same cloth. You’re introduced to Great Uncle Kenneth and Great Aunt Genevieve. Something doesn’t seem quite right. You listen. You laugh. You participate in painfully polite conversation, mainly because visions of dollar signs are dancing in your head. You try to figure out what the heck is going on. As if on cue, your mother-in-law, wife, and little sister-in-law pop up from the sofa and excuse themselves to prepare “a little something” in the kitchen. That leaves you, your father-in-law, and Great Aunt Genevieve as the entire audience for Great Uncle Kenneth’s monologue. Right before you in the living room is being played out the strangest scene you could’ve imagined. This relative you’ve never heard of is telling the most pitiful jokes which were, no doubt, hilarious – during the vaudeville era. He’s slapping his knee and saying “D’ya see?” after each “joke.” He’s choking on his own laughter just prior to each ancient punch line. And – here’s the really weird part – your very intelligent father-in-law is politely laughing at this demented old man’s excuses for joke-telling. These people must be way more than filthy rich! you might think. But then your eye is caught by lots of action in the kitchen where (just out of sight of the rest of the theater audience) your new wife, her mother, and sister are all sitting on the kitchen floor. They’re leaning back against the cabinets, holding their sides, and laughing violently – albeit silently. Hey now. Something’s not quite right with all this. Still, it’s conceivable you might continue to think this strange couple is very wealthy, and that’s why they’re being given such royal treatment. Not for another five hours do you learn just how not-right things really are and how very wrong you are. The Kenneth-Genevieve duo exit stage right, and you’re finally told what you should’ve been told long before your recent wedding ceremony. 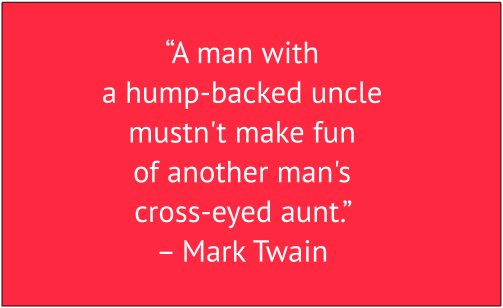 Your father-in-law simply wants to be respectful to his seriously odd uncle, and so he courteously plays the game. Your new wife, mother-in-law, and sister-in-law are courteous, too, but only up to a point. And that point clearly ends when they can watch you tiptoe through the minefield and give way to hilarious laughter, instead of participating in a very drab, very long, very boring theater experience. The Queen did not come to visit. You have not married into money. Your wife will not inherit a bundle from Great Uncle Kenneth. Instead, you have just wasted a perfectly good Sunday afternoon on your very short college spring break. In addition, you realize you’ve not only married a rather odd little woman; you now know she’s that way for good reason. She inherited it, and now you’re stuck with the whole lot of them and the inevitable musings about future children coming from this woman’s body and gene pool. Well, we don’t have to imagine that’s what you might think, if pushed with no warning into this pool. We know, because my dear husband has told me so – many times, in fact. He did not take kindly to being so abruptly and cruelly plunged into my gene pool, even if it was at the shallow end. If Hubby had thought to ask this vital fact-finding question, he could’ve got himself out of Dodge in just the nick of time, dodging a boatload of oddness. I would’ve learned that I needed to develop some fool-proof methods of sidestepping that awkward question if another guy I might want to marry should ask it. Here’s the second pay-attention lesson to this melancholy tale. YOU could be the one with a version of Great Uncle Kenneth lurking in your extended-family tribe. If so, BE VAGUE when asked about your gene pool. Or, let’s just face facts, YOU could be the way-weird one in your family for the same reasons that I am: Great Uncle So-and-So’s cursed genetics. You, too, need to BE VAGUE when asked about your gene pool. It really is a very, very good idea to get to know your guy or gal and the entire family, asking as many questions as you dare, BEFORE you get very serious about him or her. Don’t be shy. 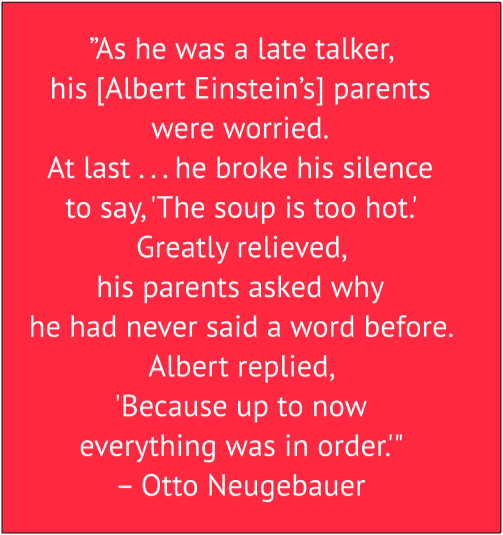 Be a persistent interrogator because your grandmother was right: we do, indeed, marry a family – not just one person. 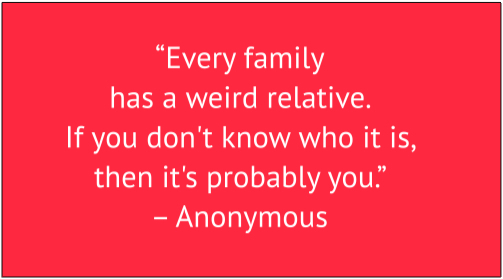 And that family may have produced a certain percent of weirdness in your beloved that can’t be mitigated by a lesser percent of lifestyle attempts to overcome the weirdness factor. I’m just sayin’. As you’ll see in Part 3, I didn’t know enough to ask the “any craziness?” question, but you can learn from my mistake. Addendum: None of the names in Odd #17, Parts 1 & 2, have been changed to protect the innocent – because they’re not innocent. Appears harmless, doesn’t it? Don’t be fooled! You know every family has at least one – the family member who is such an embarrassment no one wants to admit they know him, let alone admit they share the same gene pool. While my mother’s side had so many it was difficult to count them all, things were a good deal simpler on my father’s side of the family. My father’s family had only one: Great Uncle Kenneth. But what a whopper. You know how people sometimes turn weird in their later years? Not Uncle Kenneth. He was born that way and stayed consistently weird as he aged. But fair is fair. 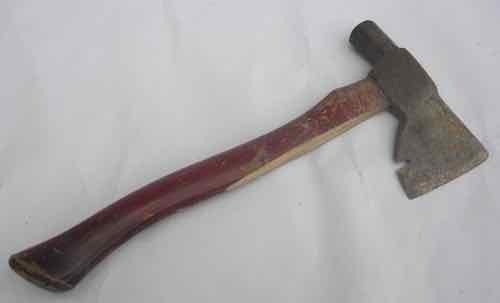 Great Aunt Genevieve couldn’t begin to compete with her husband and he, after all, was the blood relative. He was the one with whom we might share, through no fault of our own, the same genes yielding the same idiosyncrasies. She, bless her heart, appeared near-normal when compared with Great Uncle Kenneth. Of all of Uncle Kenneth’s oddities, his most outstanding was his mistaken conviction that he really belonged on stage as a comedian, instead of on the managerial staff of Eli Lilly. This was by far the trait which caused the most grating of teeth, the most downcast eyes, and the most shuffling off to get another serving of whatever at family reunions. I didn’t mind much, as I was off playing with cousins and wasn’t expected to sit through his monologues. But then there were those ill-fated Sunday afternoons when he and Great Aunt Genevieve popped in unexpectedly, and THEN I minded. We were all captives then: two adults and two children all sharing the same pain. Having never quite grasped the concept of using a telephone to ensure they were planning to visit at a convenient time, they would simply roar up in a cloud of limestone dust and take us by surprise – almost. Living on a rock country road as we did, we’d all honed the skill of determining the speed of approaching vehicles and could tell when they were planning to pull into our drive or pass on by. That meant we had, oh say, about three minutes’ notice that way-weird Great Uncle Kenneth and almost-equally-weird Great Aunt Genevieve would be gracing us with their presence that Sunday afternoon. We all had our job assignments. My father catapulted himself out of his recliner, slipped on his slippers, and tore out the front door to greet (read: detain) them. Mother flew into the kitchen to tidy up and take a frozen dessert from the freezer to thaw. My very young sister’s job was to straighten the magazines, plump up the toss pillows, and generally tidy up the living room. My job was to clean off the bathroom counter, check the stool, and make sure the towels were just so-so, etc. Now this sounds like we lived like slobs, when nothing could be further from the truth. I’m quite sure our house always looked ten times better than Great Aunt Genevieve’s ever did. Nevertheless, this was the drill, most likely because my mother kept hoping that if Genevieve were continually presented with a properly kept house, it might rub off. Thus, we could all be spared at least that much of their embarrassing lifestyle. It was a nice sentiment, but overly optimistic. If my Father had done his job properly, he would have detained them long enough that we’d all completed the drill and were casually lounging in the living room by the time he escorted them into the house. It wasn’t long before Great Uncle Kenneth launched into his patter of vaudevillian jokes and one-liners. These, I could stand. It was the grating, old-guy voice of “D’ya see?” following each one that began to wear on my nerves rather quickly. Fortunately, my mother’s temperament was about the same. After the seventh or eighth “D’ya see?” she would jump up, offer to prepare some refreshments, and escape to the joke-less reprieve of the kitchen. I tried to sneak to my room a few times at this same juncture, but was usually hauled back by a lame question from Great Aunt Genevieve. However, once I reached a certain age, I learned I could offer to “help” Mother with the refreshments and was also allowed an escape route. Genevieve must’ve recognized that I was indeed capable of helping. Once I’d reached the helping age, she graciously allowed me to follow my fleeing mother, as we vacated our front row seats in what used to be our living room but was now Great Uncle Kenneth’s theater. The other irritating thing about these two characters is that they never knew when to leave. I think that’s what caused such groans when we recognized their car. It wasn’t just having to endure banal conversation and really awful jokes. It was knowing that we were sentenced to this drivel for an entire Sunday afternoon. Whatever plans we’d had for a relaxing, nappy, Sunday afternoon were shot to pieces. While you might be the compassionate sort and feel our pain, I know you’re still left wondering. What could possibly be the pay-attention point to such a lengthy bellyaching story? Good question. This time, there’s only one, and it’s irretrievably tied to the bald fact that none of us get to pick our genes. We inherit them. ALL of them. Scientists used to believe 80 percent of who we are is determined by genetics and 20 percent by lifestyle. Not so long ago, they changed their story. Now, they’re saying it’s the reverse: 20 percent of who we are is determined by genetics and 80 percent by lifestyle. Whew, that’s a welcome switcheroo. Since scientists keep changing their minds, we don’t really know what the equation is: 80/20, 20/80, 50/50? Who knows? My stark pay-attention tip? Work REALLY, REALLY, REALLY DILIGENTLY on that precious lifestyle percent, whatever it is. Regardless of the percentage, it’s all you’ve got, baby, to protect you from your family’s version of Great Uncle Kenneth. That’s been my plan all along, as I certainly never wanted to become as odd as Great Uncle Kenneth. Wait: I just realized this isn’t a very encouraging pay-attention point. Since we’re now on my Odd #17 post, with no apparent end in sight, my plan hasn’t worked out very well, has it? But that doesn’t mean you shouldn’t try, darlin’, and TRY HARD. As for moi, I’ve tried hard, given up, given in, and pretty much decided, as I’ve said in Odd #1, to get over it. Hubby, with 46-plus years to get over his wife’s alarming, odd-infested gene pool, is over it, too. But in the beginning, it was a shocking plunge for an unsuspecting young husband: read how he fared in Part 2 of this Odd #17 post. Don’t get too smug; you have one, too, y’know. Odd #16: Teresa’s the name. Efficiency’s the game. Do you have childhood memories of regular and dreary daily chores that were your responsibility alone? I’m so sad for you. As I’ve already said, I wasn’t really expected to do much as a child. But when I was, ever the serious, conscientious, only-child-for-the-time-being, I was extremely efficient in the execution of my kid-size duties. I arrived and gladly handed over the cursedly heavy jug. He poured a full cupful from the whopping, six-ounce cap-cup and turned to survey his handiwork of rich, yellow, waving wheat all ’round. By the time he’d turned back around to pour himself another cup, I had already gathered up the jug and was trotting back down the lane. “Idle hands are the devil’s workshop,” you know. Probably about that same time frame is this story, again my father’s. One has to wonder…. No, surely he wouldn’t have made up this stuff. Odd is odd, and I was surely exhibiting unmistakable signs of it already, much to my parents’ consternation, I later learned. No problem. One nail, head-up, comin’ up. Second nail, head-up, comin’ up. 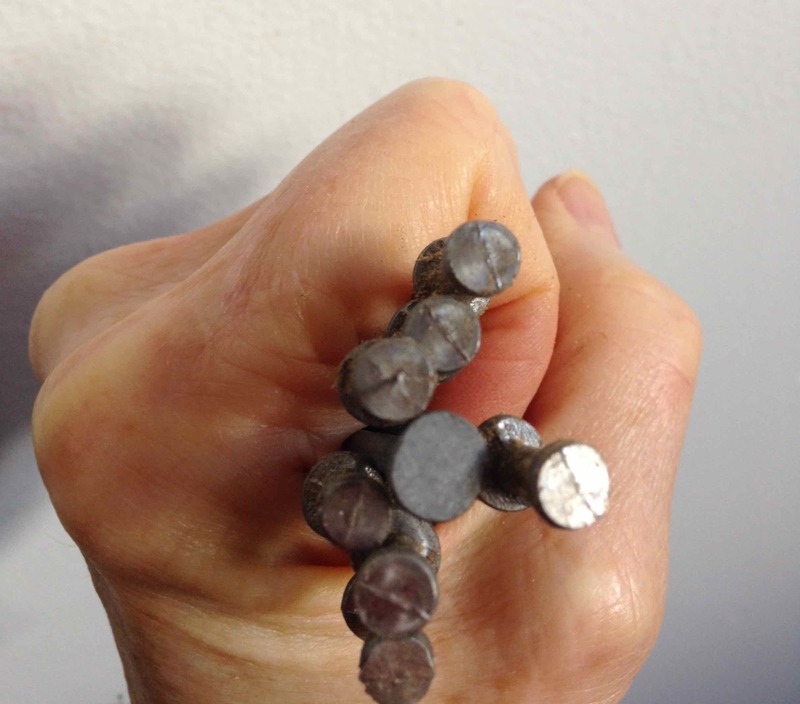 When he reached around for the third nail, I handed him an entire four-year-old’s fistful of nails – all head-up, please note, and disgustedly trudged back to the house. Honestly! Any fool could see this was not an efficient operation, and I had better things to do. One pitiful little nail at a time?? Please. Now, as I’ve said, we have to take my father’s word for these disturbing accounts of The Odd One. But let’s give him the benefit of the doubt and believe that he didn’t make them up. In which case, experiences like these might account for why my parents waited nine years to bring my only sibling into the world. They had to think long and hard about the possibility that another one might be just like The Odd One they already had. An unnerving thought, to be sure. Back to the story. I know I’ve called this aberrant behavior efficiency, but I lied – on purpose. The problem was really an extremely impatient personality in the making. There. I said it. (“They” say admitting the problem is half the battle. Who are “they,” BTW??) Impatience, it would seem, is warp and woof of who I am. Just so you know, I’m not proud of that. Here I am, approaching 70, still working on that character flaw that was so obvious when I was only four. Thought you’d never ask. There’s way more than one! This Odd post, unlike some of the other Odd posts, has slightly less obvious pay-attention points, but it makes up for that uncharacteristic subtlety by providing plenty of them. Pay attention. Character flaws – in all of us – are deeply entrenched, with tap roots reaching all the way down to China, as nearly as I can tell! Don’t blame your parents if you exit their home at age 18 with character flaws still intact. 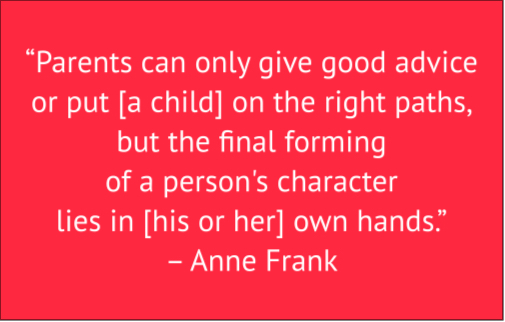 Get over it: parents can do only so much in molding your character – only as much as you choose to let them. Plan to work on your character flaws for the rest of your life. (It’s a process, like just about everything else.) Whittling character flaws down to manageable size is an endless, unpleasant, INSIDE JOB. It’s a bummer. Some things about life are, you know. Best get over that, too. Yes, I know the current PC take on character flaws is to embrace your flaws, say that’s just who you are, and aren’t you special? Oh yes, that makes sense and wins kudos all ’round. Not. Do you like your spouse’s flaws, your friends’ flaws, your family members’ flaws? No? They probably don’t care for yours, either. For the sake of those close to you, commit to working on your own character flaws. Instead of embracing your flaws, embrace each milestone in your steady and gradual taming of them. Makes a whole lot more sense, doesn’t it? Same thought from a far wiser woman than I.